Cruise your favorite waterways on her own bottom or trailer easily to distant cruisinggrounds. Enjoy the enclosed comfort. She has a Vee berth forward. There is sitting headroom forward and standing headroom in the pilothouse. A galley is to port in the pilothouse and a porta potty fits under the console to starboard. Get under way quickly with easy construction of either stitch and glue or glue and screw in rugged plywood, epoxy and fiberglass to seal up against the elements for years of lasting enjoyment. Estimated cost for quality construction materials (not including power) is $18000. This cost includes a high level of outfit and finish you can be proud of after putting the effort into building this fine boat. Purchase and Download Study Plans for the REDWING PILOTHOUSE 21 for $5.00 in PDF format (zipped file). 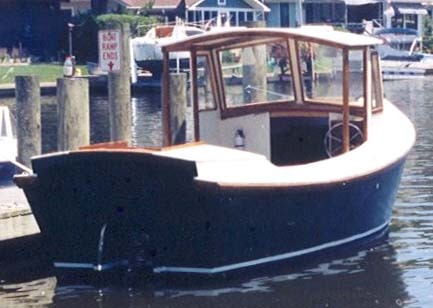 Purchase Construction Plans for the REDWING PILOTHOUSE 21 for $140.00 for delivery by US Postal Service. Purchase Full Size Frame Lofting for the REDWING PILOTHOUSE 21 for $140.00 for delivery by US Postal Service.